At the Linda Hall Library this summer I once again had to reorder my thoughts on the history of breeding. I had been focusing pre-1866: before Darwin and Mendel. While I had evidence prior breeders had some understanding of inheritance, I still expected the development of evolutionary science and genetics to effect the choices breeders made. Instead, I found that Robert Bakewell– the sheep breeder who popularized inbreeding, as discussed by Derry– had a much greater effect. And, that breeders in the early twentieth (yes, 20th!) century still used the land-based conception of breed, even in the same treatises in which they discuss the new Mendelian model of inheritance. Like fine wines and cheeses, the land lent unique “flavors” to the animals raised on it. This was a concept that pre-dated Darwin, and one that his studies could not challenge; rather, they reinforced the idea that the land itself selected certain strengths in animals, making the selection and arrangement of place as important to breeders as the selection of broodstock. Because the new science supported these views, they survived through the tumultuous rise of eugenics, with breeders of the mid 20th c. selecting desert landscapes on which to raise Arabians, and setting down on paper the breeds produced in each region, from the bluegrass to the Rockies. This reliance on terrain was not unscientific. Adequate fodder, suitable hoof wear, and space encouraging exercise in youngstock is as important to raising sound, healthy animals as genetics. Early modern breeders understood both were necessary for a program to produce consistent quality. Today I start research at the National Museum of the Morgan Horse. Morgans developed a separate breed identity much earlier than other non-Thoroughbreds. And the early American “golden cross,” for trotters to saddlers to quarter mile horses, was “Kentucky” or Thoroughbred stallions and “Vermont” or Morgan mares. I love the breed, but I never expected them to be so central to my research! Wow, it’s been a long month. Among the multitude of other graduate student-ly things I’ve been up to, I’ve started writing for the Sport in American History blog. Last month, they put out a call for contributors. Noticing that they didn’t have adequate equestrian coverage, I thought: “why not?” U.S. history isn’t technically my field, but I am fairly well versed in the equine aspects, and I am certainly involved in horse sports. I didn’t consider how very different sports history, and writing about sports history, is. It has been a wonderful opportunity, and has made me re-think the way I look at certain sources and events. Anyway. My first post was set to go live today (Halloween), so I searched for something suitably festive to write about. Originally, I wanted to write about Frank Hayes, and his posthumous win on Sweet Kiss. What could be more halloween than a jockey who won while dead? But, there are already a number of articles floating around about his unique win. A number of them leave out the impressive fact that it was a steeplechase, but in all plenty of good reading. This one is my favorite. So, that was out. I decided to dig in to the potentially grisly tradition of burying the head and hooves (and sometimes heart) of racehorses separately. Some notable horses are buried whole, and some have even been carefully exhumed and moved. With one of these major exceptions being Secretariat, I planned to organize my discussion around him. He is a very accessible figure, being fairly well known even outside of racing circles. In my initial research, I discovered that Secretariat’s burial stood out even from other racehorses who have been buried whole (you’ll have to read the post for more!) One of my advance readers was rather disappointed that I didn’t go with the dismemberment topic, because clearly the practice was to prevent zombie horses. And that means: Zombie Secretariat is possible! 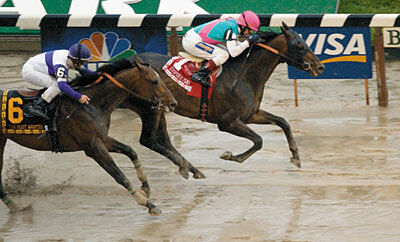 It is worth noting that the American horse who’s passing was observed most similarly to Secretariat’s was Man o’ War. Read the Sport in American History post to see why. At *every* conference presentation I’ve given on horse-related topics I have gotten a question about eating horses. So, of necessity, I collect assorted references in order to answer this entirely off topic question. Robert Burton. The Anatomy of Melancholy (Kindle Locations 3815-3818). Here the eating of horse meat is dismissed as a foreign practice, and the meat considered of lower quality. It is rightly compared to red deer (much larger than white tail), having a similar low fat content and long muscle fibers. Studies by John Clark suggest that horse meat went out of vogue around London in the 14th century, but survived at a lower volume in more remote areas (in those cases possibly indicative of lack of other meat sources, or inability to feed the horses). With Anatomy of Melancholy first published in 1621, it is reasonable that the practice of eating horsemeat was well out of memory, especially in light of the long rhetoric of the Church against the eating of horsemeat as a pagan practice. Robert Burton. The Anatomy of Melancholy (Kindle Locations 4043-4046). Again both China and the “Tartars” (Tatars) are mentioned as eaters of horse. I expect this actually does have basis in fact (although “raw” is a bit of an exaggeration– acid cooked is more likely). Despite being in a section that claims to be fairly moderate in view, suggesting that there are in all parts (including those close to home) dietary customs that others would consider unusual, and each man’s body has its own unique nutritional foibles, the inclusion of cannibalism in this section makes it unlikely that Burton actually supports other unusual practices. On November 20th 1627, Charles I of England issued a proclamation outlawing snaffle bits for horses “employed for [military] service.” Had Charles I not been deposed, he would likely be credited with the creation of the Thoroughbred horse; the General Studbook was published in 1791, but despite the dispersal of Charles I’s herd and brief suppression of racing, horses he imported still had a large effect on the new breed. The outlawing of snaffles for military use suggests than many lords were employing their race or hunt horses (ineffectually) for service. Burton seems to have a comfortable familiarity with “modern” racing (despite sometimes trying to shoehorn in ancient comparisons), but still upholds the hunt and the height of gentlemanly “disport”; I’ve been wondering at why, and these are some possibilities: hunting was still more in vogue; hunting was a more “active” and therefore healthful sport (air & exercise); or the possibility of “real” racing still being reserved to the most elite, while hunting was available to the gentry. Robert Burton. The Anatomy of Melancholy (Kindle Location 1204). My wonderful girlfriend got me my own, mine-to-keep (and not stay at the barn), copy of Jeanne Mellin’s Morgan Horse Handbook. I haven’t had access to this treasure for some seven years, and that was before I became an “official” “historian” (whatever that means). It did not lose its shine. Although I had been enthralled with her history (particularly the Dutch theory of Figure’s origins, having noted the similarities between Morgan and Friesian skulls and legs the first day I met a Morgan), I had been more focused on her exacting and uncompromising descriptions of conformation, correct movement, and proper handling. Her standards were precise, with detailed descriptions, invaluable illustrations, and firm ethics that are sometimes hard to see at horse shows (in any breed or discipline! ), as good trainers are often quiet and the questionable ones are often the loudest. But, back to the history! The True Briton (Thoroughbred) theory of Figure’s (Justin Morgan, the Horse) parentage, I believe, gained traction because of it’s inclusion in Joseph Battell’s 1894 Morgan Horse Register. However, even Battell presents the idea as hearsay. Re-reading Mellin’s book gave me enough information to do some further digging, and I found this (see page 12) from 1879. I highly recommend Morgan history enthusiasts read the whole article (it is delightfully and entertainingly written! ), but here are some key points: Justin Morgan (the owner, not the horse) did have True Briton at his farm for two seasons, and his nearby cousin for one. However, all three seasons were several years prior to Figure’s conception. The article then sets out that “Young Bulrock,” a Dutch horse (presumed from the Hudson colonies), who stood at Church’s farm the year before Figure’s birth, and being the only nearby Dutch stud advertised, must logically be the sire of the sport colt whom Justin Morgan himself referred to as a Dutch horse. I’m not ready to write Young Bulrock on that pedigree, but I find it much more plausible than True Briton. Sadly, the far future has not yet come. *in the days before the foundation of the Morgan Horse Club, and indeed here before Battell’s landmark Register, many horses of Morgan breeding were registered as Trotters. While there were horses in the Americas well before Figure (The Justin Morgan Horse), and even earlier ‘breeds’ developed in what is now the United States (the Narraganset Pacer comes to mind), Figure’s timely birth along with his astounding versatility, and the all-important ability to pass on his traits, are what allowed the Morgan Horse to become the first truly American (as in U.S.) breed. This stud ad was recently posted by The Morgan Horse Museum. The ad is by Justin Morgan himself, when Figure was about five years old. There are two things I’d like to point out about this ad. This first is the fee- $1, for a “single leap,” no guarantee. While this seems like a ridiculously tiny fee to us, “full-blooded” (i.e. Thoroughbred) stallions of the time often stood for only $5, and only imported champions were likely to command more than $25. Figure was of course not full blooded, but rather an unregistered and unregisterable “sport,” and at this point still rather young. 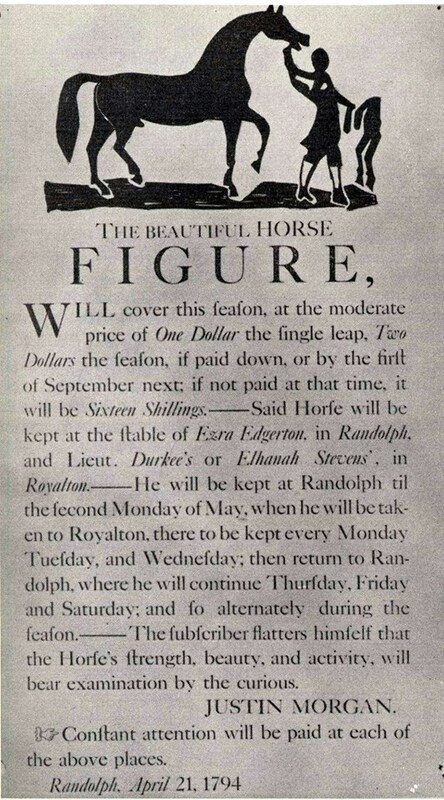 So with only a couple of seasons of accomplishments, a scant handful of foals on the ground (with possibly none ready to be ridden), and his “strength, beauty, and activity,” he merits a full dollar fee and being stood in two towns in the same season (a common practice for quality studs). *See the Morgan Horse Register, Vol 1. Notably, True Briton and Wildair were both owned by Col. James De Lancey. **His current “official” pedigree is 3/4 early Thoroughbred (more like today anglo-Arabs, or even Akhal-Tekes) and 1/8 Arabian, though there is some question as to wether his damsire Diamond was in fact full blooded. Even if Diamond was only half Thoroughbred himself, that would still make Figure 5/8 Thoroughbred and 1/8 Arabian: in effect, 3/4 Anglo-Arabian! Many years ago I was keeping an eye on a young “good looking” son of Unbridled. He lost to Funny Cide, who he had previously beaten, in the Derby; his connections opted out of the Preakness. When Funny Cide won in Maryland, I was shocked (and lost a strange bet). I had been sure it would be on his home turf in NY that Funny Cide would shine. Of course, maybe things would have been different if the Derby runner up was there. In the Belmont, that runnerup had bittersweet redemption, denying Funny Cide the Triple Crown and ensuring the drought went on. Now, Empire Maker is returning to the states to stand within miles of his son and his grandson, who finally ended that drought. I’m really not sure standing them ALL in KY is best, but I’m sure plenty of owners will be willing to ship good mares. The Retired Racehorse Project started half a decade ago. When you say it that way, it seems like a long time. But in reality, it has been only a handful of years since the Pittmans spearheaded the newest, most energetic, and now I dare say most successful effort to revitalize the industry and show the inherent value Thoroughbreds. Coming off the overwhelming success of the Retired Racehorse Training Symposium at their home farm in 2009, the organization had a slow but very steady start with demos and seminars at the Maryland and Pennsylvania Horse World Expos (always a highlight of my year while I was living in MD, particularly Erin’s nutrition talks and Steuart’s demos). At the end of 2011 the website launched, and the first competition, the 100-day trainer challenge, was announced. It was a wild success (I’d rarely seen so many spectators packed in the stands, short of international clinicians). Within a year I saw the price of Thoroughbreds double, even triple throughout the Mid-Atlantic. The entire economy was enjoying a brief uptick, but Thoroughbreds had gone from the very bottom of the market- I bought several nice, already retrained Thoroughbreds for between $1 and $500 in the years directly prior- to competing in the market with Quarter Horses, Paints, and even once again with warmbloods. The “rebranding” of Thoroughbreds had been successful, and a network of education was being built. And it didn’t stop there. Rather than compete with other organizations, the the RRP has become a bridge not only between trainers and owners, but also between the multitude of Thoroughbred organizations. I think it is this co-operative, symbiotic system that is the RRP’s greatest contribution, and the key to their success. This year’s “Most Wanted Thoroughbred” makeover contest (also sponsored by Thoroughbred Charities of America) secured the Kentucky Horse Park and attracted close to 200 entries- almost double what was expected, and a far cry from the three horse demos that started the movement. It was, for the first time, international. And truly, astoundingly diverse in disciplines. I have watched friends videos with great envy, and also with great hope for the future of the breed and the industry as a whole.